Go to the Data Options tab. 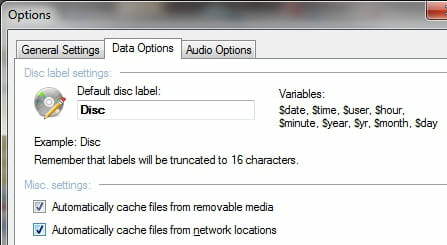 In the "Misc.settings" section, check "Automatically cache files from removable media". Click on Apply and then on OK to validate. Published by deri58. Latest update on November 1, 2012 at 10:37 AM by deri58. This document, titled "CDBurnerXP - Automatically cache file from network locations," is available under the Creative Commons license. Any copy, reuse, or modification of the content should be sufficiently credited to CCM (https://ccm.net/). How to burn an ISO image with UltraISO?